Kenya is well known for its wonderful avocados. Soft, buttery emerald green fruits packed with vitamins E and B, mono saturated fat and rich in potassium. In India avocado is sold as butter fruit. When I was living in Bangalore, during my first visit to the vegetable shop, I had a tough time asking for avocado. The poor guy just didn’t understand what I wanted. He just shrugged his shoulders and helped me with my basket to the till. In other words he was perhaps trying to tell me ‘please ma’am just leave the shop with what you have found and don’t fry my bheja!’ The following week I went to the super market Big Bazar and there these delicious fruits were sitting pretty on the shelf under the label BUTTER FRUIT! 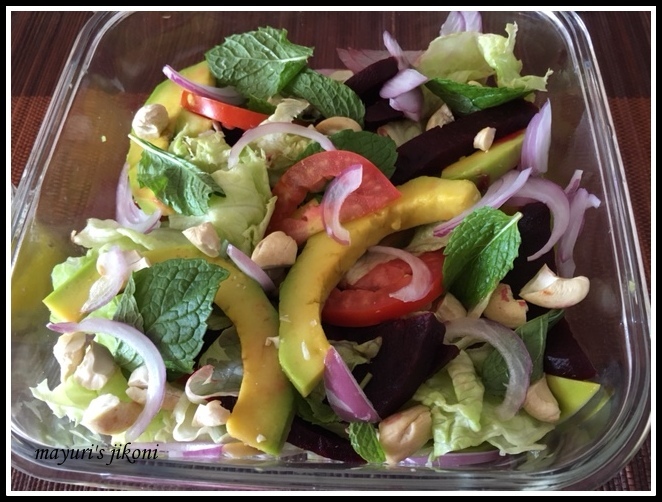 The hues of green from the avocado and lettuce, and the bright red of the beetroot just makes this salad mouth watering. Layer the vegetables and fruits into a bowl. Leave it in the fridge till ready to serve. To make the dressing, mix the oil, lemon, salt and pepper and pour over the salad just before serving. Sprinkle the nuts over it and serve. As soon as you cut the avocado, mix some lemon juice into it to prevent it from turning brown. Whenever I use beetroot in my salads, I avoid adding some form of sweetness like sugar, honey etc as beetroots tend to be sweet. Any nuts of your preference can be used. Note I used the word layer instead of mix. If you mix the salad before taking it to the table, the beetroot tends to ‘bleed’ and will turn the whole salad red. Instead of normal tomato can use cherry or tiny plum tomatoes about 1o or so. If you do not find fresh mint , use fresh coriander. love this mint leaves in it, looks very refreshing, i just love to eat it as it is without dressing. That is my kind of salad. I am obsessed with avocado salads at the moment.